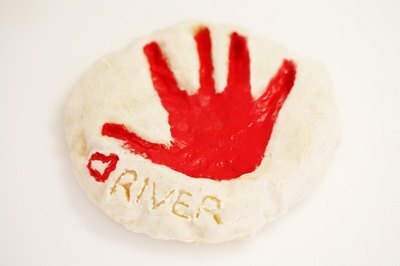 Casting your child's handprint in homemade clay dough creates an inexpensive and long-lasting reminder of those fleeting childhood days. Baker's clay, sometimes called salt dough, is safe and non-toxic, and dries to a hard finish that can be painted and sealed with clear nail polish. You can make a series of handprints through the years to demonstrate your child's growth, or give the finished product as a gift to grandparents who are certain to cherish it. 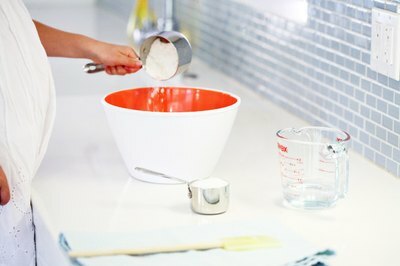 Mix ½ cup salt with ¾ cup flour and 2 teaspoons cream of tartar in a medium mixing bowl. Slowly add ½ cup water, stirring as you pour. Slowly add ½ cup water, stirring as you pour. 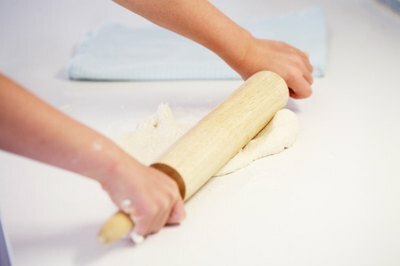 Knead the mixture with your hands until you have a firm, blended clay dough. Add a tablespoon of flour if the dough is sticky. 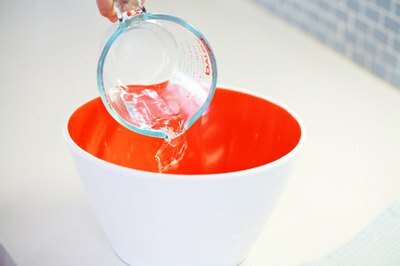 Add a tablespoon of water if the ingredients feel too dry. 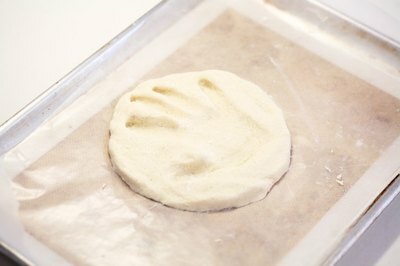 Roll the clay dough out onto a floured cutting board until it is about one inch thick. Shape the clay dough into a circle. 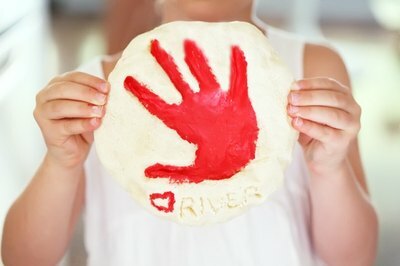 Press your child's hand, fingers splayed, firmly into the clay dough until a clear impression appears. 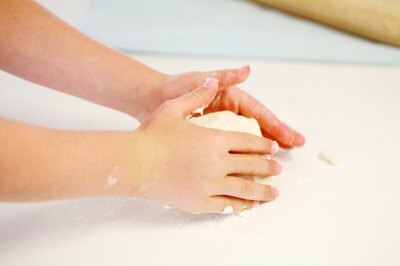 Press your child's hand, fingers splayed, firmly into the clay dough until a clear impression appears. 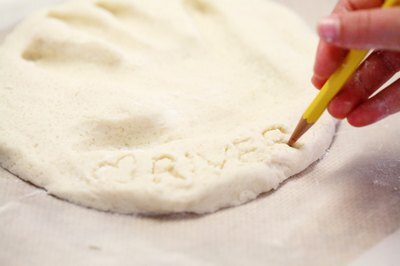 Etch your child's name and a date into the clay dough with a pencil. For a newborn, etch the date of the child's birth. For older children, etch the date the handprint was made, and the child's age at the time. 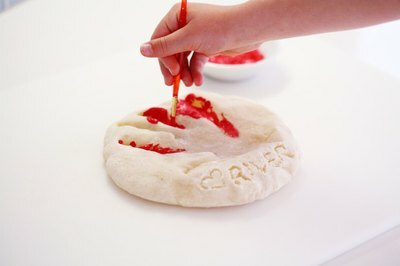 Press a small hole through the clay dough at the top if you wish to hang the handprint after it dries. Carefully transfer the clay dough onto a cookie sheet with a spatula and place on the center rack of a preheated oven at 100 degrees Fahrenheit. 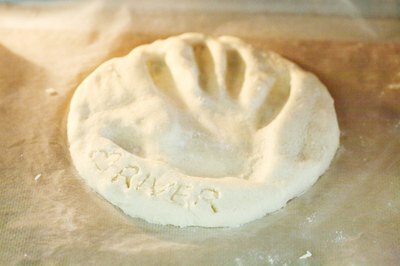 Bake the imprint for 30 minutes, and then turn the oven off and leave the clay in the oven for two additional hours. Remove the cookie sheet from the oven and set it in a dry place until the dough is completely dry to the touch. This may take up to two days. Smooth away any cracks in the clay using a paintbrush dipped in water. Paint the handprint when the clay is dry. And you're done! Your handprint is ready to give as a gift (perfect for Mother's Day, Father's Day and Grandparent's Day), to be put on display... and to have as a keepsake, someday reminding you that your child's hand was once that small.